Sharing ideas at the Scottish Records Association conference. 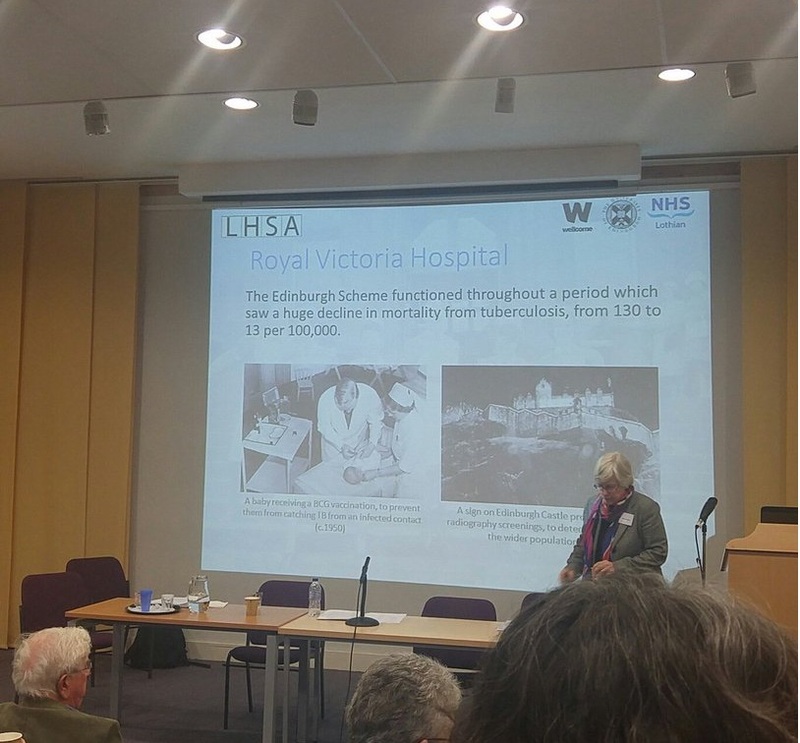 As you may know if you follow LHSA blog, three weeks ago part of our team went up to Perth to attend the Scottish Records Association conference about healthcare in Scotland before the NHS. As Alice has outlined, it was a very enriching experience and today I would like to expand a bit on our contribution and what I got out of the conference. The projects I have been working on for almost a year, along with my co-worker Becky, were relevant to the subject of the conference: indeed, both the Norman Dott project and the RVH v TB project deal with medical case notes which partly predate the creation of the NHS. Moreover, the cataloguing methodologies we use could be of interest for anyone working with medical archives of a similar nature. We therefore took the opportunity of this conference to disseminate and explain our projects. For this purpose, we created two leaflets presenting the scopes, aims and methodologies of the projects for the delegate packs, and we put together a 10-minute long PowerPoint that was shown during the breaks. We were also available for any questions or enquiries about the projects and/or LHSA – I did receive an enquiry about Norman Dott from a lady whose relative had worked with him several decades ago, and it made me glad to know that this great surgeon was still remembered and talked about in Scotland more than 40 years after his death. The LHSA PowerPoint at the conference. All talks were very interesting and covered different subjects that helped to understand the theme from different points of view. 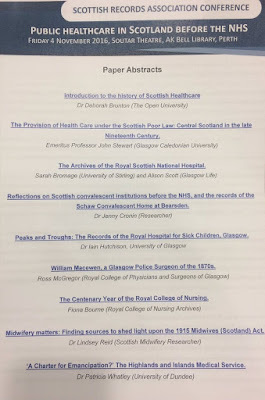 One in particular caught my attention: the talk of Sarah Bromage and Alison Scott about the archives of the Royal Scottish National Hospital, held by the University of Stirling. The Royal Scottish National Hospital was established in 1862 and provided education and medical care for mentally impaired children in Scotland in the 19th and 20th centuries. Their collection consists of case notes, correspondence, reports and registers as well as a little over 3000 applications for admission. The latter contain information on the family’s circumstances, the child’s health, behaviour and educational abilities. The format of these documents reminded me of the case summaries we find in the Dott and TB collections: a high number of short, standardised forms with biographical and medical information on each individual. I found it interesting to see how they were being catalogued, to spot any difference and/or similarity with our own method: for example, the use of index terms for medical information, and the closure period of 100 years for clinical records. It also made me wonder how our own cataloguing methodology could be adapted and applied to such a collection, which is slightly different but also deal with sensitive data, a high volume of personal information, and medical records. Indeed, one of the objectives of the Dott and TB projects was to develop a methodology that could be used for similar medical archive collections. The programme of the conference. Overall, it was very interesting to hear about archives to which our methodology could potentially be applied. It is exciting to think about the sheer volume of information that could be made accessible to the public, and the opportunities for research and family history this represents. This is why going to conferences and learning about other projects, in addition to being really educational and enjoyable, is essential. To find out more about the Scottish Records Association, click here . On the 4th of November, Samar, Aline, Becky and Alice travelled up to Perth for the ScottishRecords Association conference. This year’s conference was focused on the use of archival records to research the provision of healthcare before the NHS – so naturally we were all very interested! As LHSA’s records are predominantly focused on healthcare in the Lothian area (the clue is in the name! 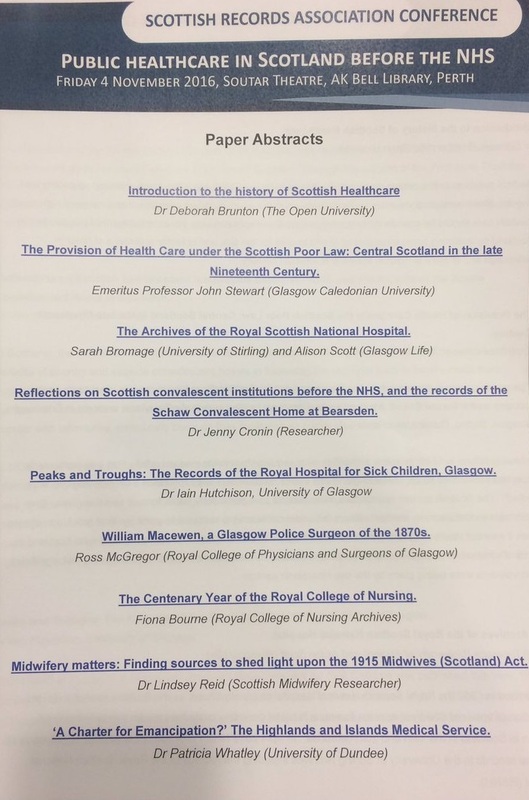 ), it was useful to situate our collections, approaches and practices into a wider context, and consider how they inform and are informed by Scottish healthcare in other areas. This really struck me when listening to Caroline Brown present Dr Patricia Whatley’s paper on the provision of healthcare in the Highlands and Islands. She explained how an 1852 enquiry found that many doctors were working for salaries that were small and insecure, and how this was exacerbated by the physical environment they were working in. Doctors might have to travel great distances over several days (in often treacherous weather) to reach their patients, with no guarantee of remuneration afterwards. This meant that doctors could find themselves penniless as a consequence of the profession they had entered into, unable to save for a pension and professionally isolated. Based as we are in Edinburgh, it’s hard for me to imagine a similar fate befalling the doctors that are found in our records – on the contrary, they were in the heart of the medical world with resources, peers and opportunities on their doorstep. This was just one of the excellent talks we heard – you can read the full twitter coverage on our Storify page. The following week saw me approach archival materials not from a research point of view, but using them as springboards to discussion instead. I took part in a workshop at Glasgow’s beautiful Mitchell Library that was run by Scottish Council on Archives, and was centred on using WWI records in education in creative ways. We were asked to take along a selection of WWI records from our collections and then explore as a group how they might be used. As the attendees ranged from archives, to libraries, to heritage centres, there was quite a selection of resources to consider, and a whole range of backgrounds that informed our discussion! I was particularly interested in how WWI records can be used to explore the domestic experience of war – although we tend to think of those on the front line as being the ones affected, there are glimpses in the records of the impact that war had on life at home. 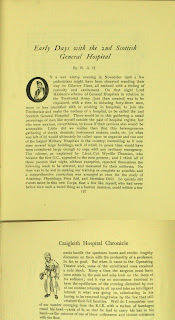 For example, this article from a Craigleith Chronicle describes how the Hospital was set up and staffed by volunteers – some of whom didn’t have particularly strong stomachs when they began their new medical careers! This Monday Aline, Samar and I were treated to a behind the scenes glimpse at the collections in the RoyalCollege of Surgeons of Edinburgh archives. Their collections date back to the 1460s, and include a continuous run of Minute Books from 1581. Like LHSA, their collections are vast, ranging from institutional records to the papers of notable individuals and organisation involved with medicine and surgery. A particular highlight for me was the photo album of Craigleith Hospital – I got very excited when I saw that there were names written in the album! Although we hold a lot of photographs relating to Craigleith, few have names, so hopefully we can one day identify some of the men and women in our collection. A huge thank you to the Scottish Records Association, the Scottish Council on Archives and the Royal College of Surgeons of Edinburgh for hosting some brilliant events this last month! Samar has joined LHSA for a year on the Scottish Council on Archive's Skills for the Future Programme. As a part of her traineeship, it is encouraged that she completes training days at a variety of archives in order to gain a broad understanding of the archive sector. As a part of my traineeship, I had a day out of the office attending an event for Housing History Day, which was jointly run by the Tower Block Project and the Our Place in Time Project. I had a really great time, and learnt lots of new things that I thought would be worth sharing with you! The morning was spent at Historic Environment Scotland (HES), which is an organisation that investigates, cares for and promotes Scotland’s historic environment. We participated in a series of workshops about the history of housing in Scotland, which were led by Diane Watters and Dawn Ewers. During our workshops, we were given an introduction to the Tower Block Project. Through the Tower Block Project, HES is creating an interactive visual archive of Britain’s multi-storey public housing with the aim of recording every tower block built, including those that have already been demolished. The project is being run by Edinburgh College of Art and recently received funding from the Heritage Lottery Fund to help digitise photographs and support local outreach initiatives which encourage high-rise residents to tell their stories, and aid them in telling community histories. 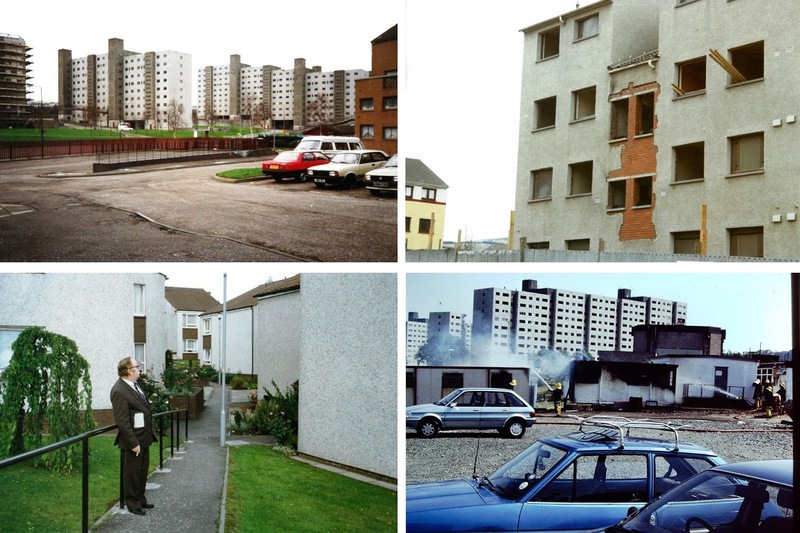 In order to expand the Tower Block Project’s collection, HES have also been collaborating with Our Place in Time, a project based in Wester Hailes which aims to record the constantly evolving history of the Wester Hailes estate. 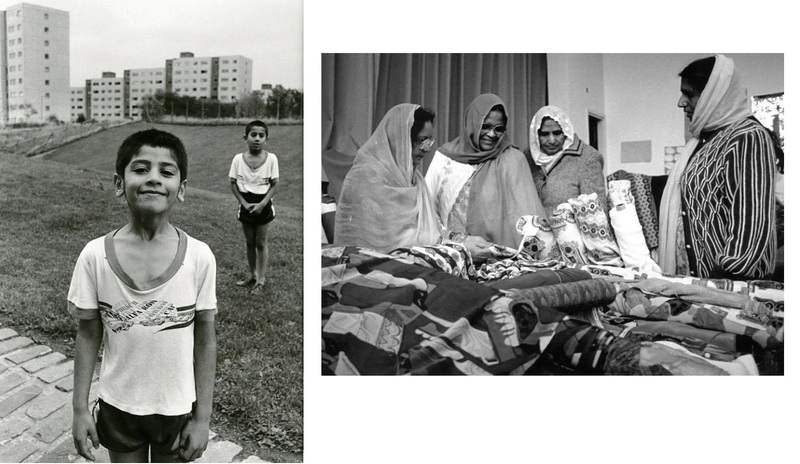 Archive Images of Wester Hailes courtesy of Prospect's Facebook page. We also attended a seminar which provided us with guidance on how to research the history of buildings in Scotland, with a specific focus on local history and housing. HES have a number of diverse resources available on architectural history, including preservation registers, publications, building surveys and inventories, aerial photographs of Scotland from several time periods, as well as 18th and 19th-century etchings, drawings and paintings of residential buildings and estates. After the workshops, we were given a tour of HES’ archive and library, which gave us an opportunity to see some of these materials in person. In the afternoon, we travelled to Wester Hailes together to visit Our Place in Time’s archive. Our Place in Time has not only collaborated with HES, but a variety of community organisations in Wester Hailes and West Edinburgh, as well as other institutions within the wider Edinburgh community. One of these community organisations is Prospect, a community housing information service which houses Our Place in Time’s archive. When we arrived at Prospect, we were given a presentation introducing the Our Place in Time project. We learnt that in the process of recording the history of Wester Hailes, the project ensures that all Wester Hailes residents, past and present, can contribute to the documentation of their history. The information gained by this project also hopes to help plan for, and secure, future opportunities for the Wester Hailes area and community. 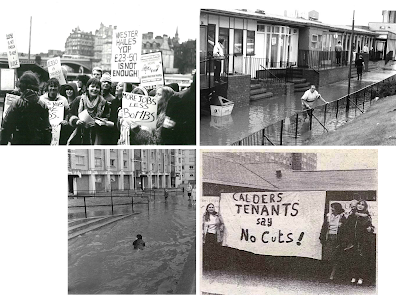 In order to ensure this, Prospect have created a blog entirely dedicated to the project which includes articles, images of archive materials, community maps and a timeline of Wester Hailes’ history. In addition, Our Place in Time also provides online access to their archive materials through their own website and very popular Facebook page ‘A Wester Hailes Story’. The archive material I most enjoyed exploring at Prospect was the ‘Sentinel’ collection. 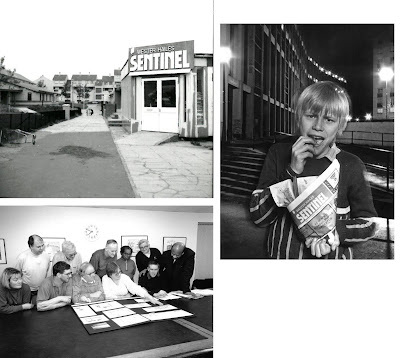 The Sentinel was a community newspaper which ran in the Wester Hailes area from the late 1970s through to the year 2000. The Sentinel provided a voice for the community, both within Wester Hailes and out to the rest of Edinburgh city. The Sentinel archive is now fully digitised, broadening its reach to a global community. After the digitisation project was launched online, local social media activity led to a relaunch of the newspaper as a digital news service. Citizen journalists around Wester Hailes collect stories on smart phones and tablets and upload them to the relaunched Sentinel. We ended the day with a social history walk around Wester Hailes, which was led by Eoghan Howard, one of the partners of the Our Place in Time project, and a Wester Hailes resident. The walk demonstrated the area’s history, the history of post-war housing in Wester Hailes tower blocks, and the narrative of Wester Hailes as told in the Sentinel. My favourite site that we visited on the walk had to be the totem pole next to Union Canal. It was installed in December 2012 and is a symbolic “ladder to the clouds” which represents all the information about Wester Hailes which is now in the digital “cloud” online. The pole includes 5 quick-response (QR) codes which, when scanned with a smart phone, links passers-by with all the online resources about Wester Hailes made available through the Our Place in Time project. 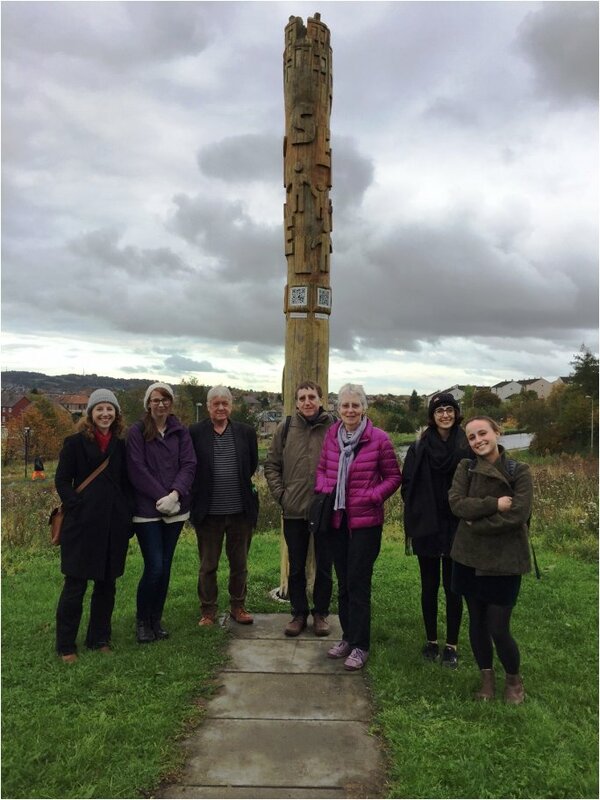 The pole was designed by local people who decided what images represented Wester Hailes, and the carving of the designs was also done by the local community through a series of workshops organised by community-led arts charity and social enterprise WHALE Arts Agency. You can watch the ceremony in which the totem pole was raised online. A picture we took by the totem pole courtesy of Prospect's Twitter account. On return from maternity leave, Project Cataloguing Archivist, Clair Millar, gives us an insight into joining the RVHvsTB project. In what has seemed like a very quick year, I am very pleased to be back working on LHSA’s Wellcome Trust funded projects. I am now working on our RVHvTB case note project, with fellow Cataloguing Archivists Becky and Aline. 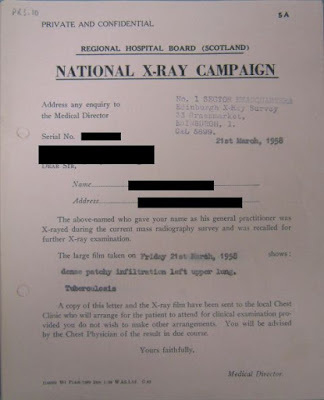 I will be working to complete cataloguing of the third part of the collection, LHB41/CC3 ‘Regional Hospital Board National X-Ray Campaign case files’. This series relates to the Edinburgh X-ray Campaign of 1958, a collaboration between the Department of Health for Scotland, the Regional Hospital Board, the Edinburgh Corporation (now Council) and the residents of Edinburgh. As early as 1944 there was a build up to this campaign, which recognised that alongside the introduction of new drugs in the efforts to combat TB, there was also a need for detection of the disease through concerted screening of the population at risk. Thus, Mass Miniature Radiography (MMR) was born which in essence was mobile units, in vans, that carried X-ray screening equipment and set up in community areas to encourage as many people as possible to be screened for TB and other abnormalities. This was effectively a ‘mobile hospital’ that would come to you and had particularly successful results in Edinburgh. The evidence of these efforts can be seen within the series that I am cataloguing which consists mainly of referral notes with patients’ results of the screening process. Below is a fairly typical (redacted) example of one of the referral letters. Before taking a more detailed look at Edinburgh’s 1958 X-ray campaign lets return focus back to the history of MMR. As Becky and Aline have already mentioned in previous blog posts, throughout the twentieth century major transformations were taking place in the fight against TB, including antibiotic drugs and the BCG vaccination. However, a final push was needed to bring the disease under control and an emphasis was made on the importance of finding undiagnosed cases that were potentially new sources of infection. In theory this would not only lead to referrals for follow-up treatment but also raise awareness of the infectious nature of the disease that threatened the population. The first MMR units had been operating across Scotland since 1944 but on a very small scale. 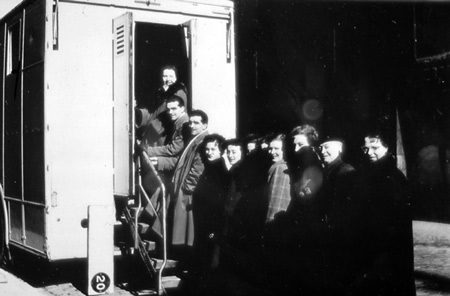 It was not until 1956 that the Scottish Secretary of State announced a more ambitious MMR campaign which aimed to make a more valuable response at tackling the disease via a fleet of MMR units and enhancing publicity of the campaign. .
National investment into MMR units was a way of creating a rapid survey which reflected the extent of the spread of TB. By literally using miniature X-ray equipment, in the form of a 70 mm wide film and by using low doses of radiation, it meant that the process of screening could become portable. A mobile van transported the MMR units and they could go straight into the heart of public hotspots, such as workplaces, schools and community areas. X-ray screening could produce relatively quick results to catch active TB and it was also used to detect any other abnormalities mainly in relation to chest and cardiovascular diseases. In either case, referrals were then made for the patient to go to the appropriate medical specialists, in the form of a Chest Clinic or their GP for further investigation and treatment. The two year MMR campaign was eventually launched in Edinburgh in 1958 and proved to be very successful due to good organisation and effective publicity. It was recognised that alongside increasing the number of mobile units on the ground, public co-operation and support was key to making progress. This concept laid the foundations for what was to be labelled a ‘Community Campaign’, where the public played an important role not only by attending screenings but there were also many volunteers recruited to co-ordinate screenings and help persuade people to attend. This raised awareness led to a success rate of 84.4% of Edinburgh’s population being screened and contributed to the permanent decline in the rate of TB. Interestingly, I came across a piece of correspondence amongst the MMR case notes that mentioned entry into a prize draw for those X-rayed throughout the campaign. Upon further research into the Edinburgh MMR campaign, it appears that many incentives were used to encourage the public to attend a screening, including awarding them with both a badge and a raffle ticket that entered them into a special prize draw. There were some serious prizes that were donated to the cause up for grabs. Coming in at number one was a £3000 house, followed by a car, £2 per week pension for life, a bedroom suite, and a lounge suit, as well as numerous other smaller prizes. 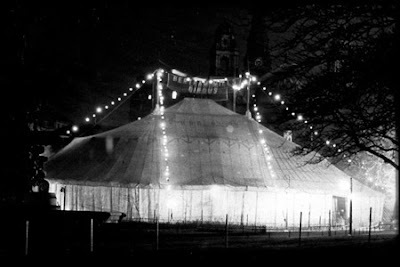 In just three weeks a total of 55,000 people in Edinburgh were also enticed to attend a screening, when a ‘Big Top’ circus tent was erected in Princes Street Gardens to provide entertainment for those awaiting X-ray. These methods of persuasion were further enhanced by the general publicity promoted by the Campaign. 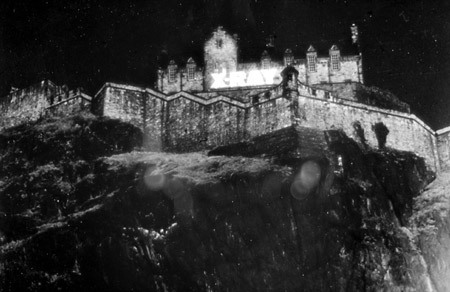 Banners, posters, press releases, cinema and radio advertising, as well as an illuminated sign projected across Edinburgh Castle contributed to a well-executed public health campaign in Edinburgh and highlighted the importance of public participation in the fight against TB. F Ryan, Tuberculosis: The Greatest Story Never Told. Bromsgrove: Swift Publishers, 1992, pg 381. 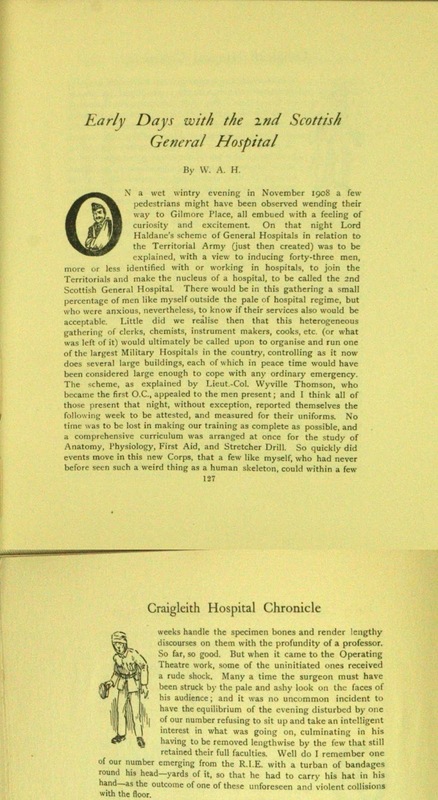 I Levitt, “TB, Glasgow and the Mass Radiography Campaign on the Nineteen Fifties: A Democratic Health Service in Action,” A paper prepared for Scottish Health History: International Contexts, Contemporary Perspectives Colloquium, 2003, pg 1-6. H E Seiler, A G Welstead, and J Williamson, “Report om Edinburgh X-ray Campaign, 1958,” Tubercle, vol. 39, 1958, pg 340.